In Joffre Gorge, one can truly appreciate the power of water shaping the landscape. The gorge hosts impressive waterfalls, cool pools and breath-taking views. Joffre Gorge is located only 300 metres from the Karijini Eco Retreat reception area, a short 10 minute walk. 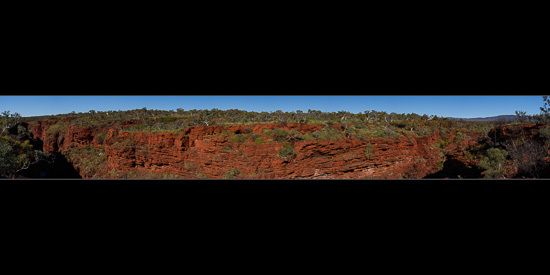 This is an eight (8) frame stitched panorama looking over Joffre Gorge from the Karijini Eco Retreat side of the gorge. Theres a very nice lookout on both sides of the gorge (both are on the right side of this panorama). From the lookout on the right you can follow a marked path into the bottom of the gorge and on to the first pool downstream of the waterfall. The path down to the bottom involves working your way down a number of these rock plate ledges till you reach the bottom. It’s quite steep and you do feel a little exposed in areas (falling wouldn’t be a good idea). The somewhat confusing view above is actually looking down into the gorge from above (about half way down). 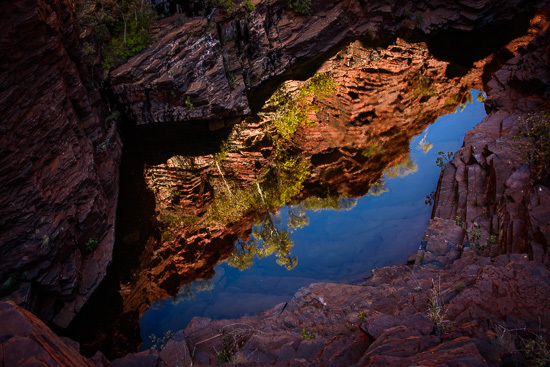 Seeing that fantastic reflection off the coloured gorge walls with afternoon light (3PM) being reflected in the waters below. You can see all those ledges of rock you have to work your way down to get to the bottom. My daughter and I made the trip down whilst my parents waited up top. Once at the bottom I headed left a short distance to shoot downstream (literally at the left bottom corner of the image above). The rocks here are extremely slippery when wet so I had to be extra careful not to slip and tumble down the crevasse into the pool below. Not only would I likely be injured but it would be impossible to get back up. 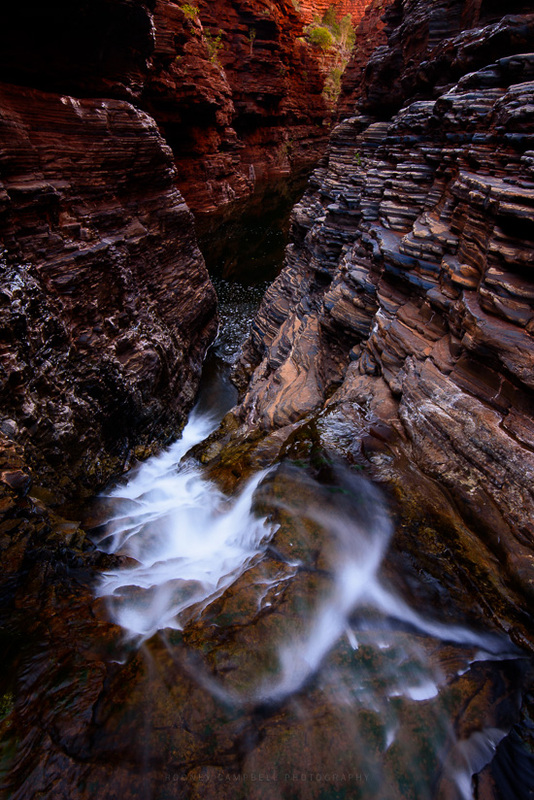 This was my first real view and first shot of this style of narrow gorge with the water flowing briskly down the chute. This was much more like the images I’d seen online of this fantastic location with the narrow water filled chutes with coloured layered rocks up the sides. I was looking forward to seeing many more instances of this in the coming days – I wouldn’t be disappointed.